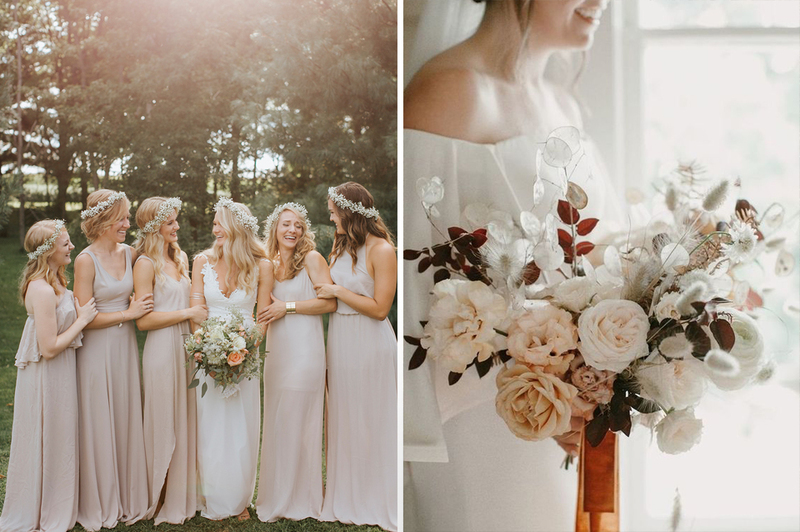 2019 is set to be another BIG year for weddings and if you’re getting married in the next twelve months, there are lots of super hot wedding trends coming your way. 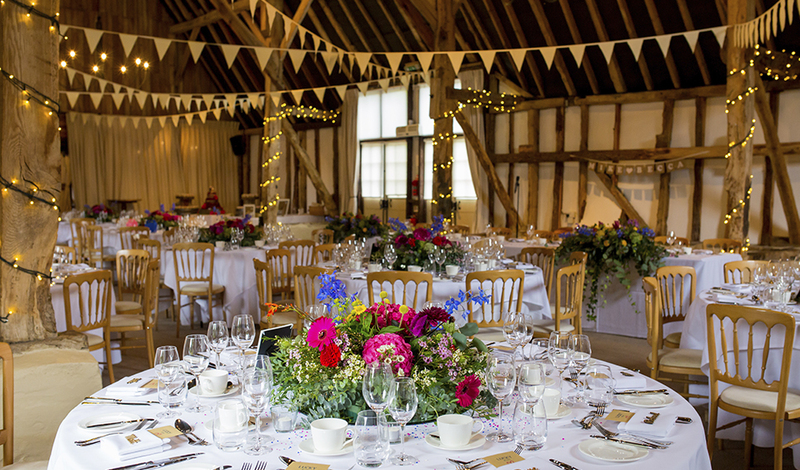 The Clock Barn team has carefully selected their favourite wedding ideas just for you right here. 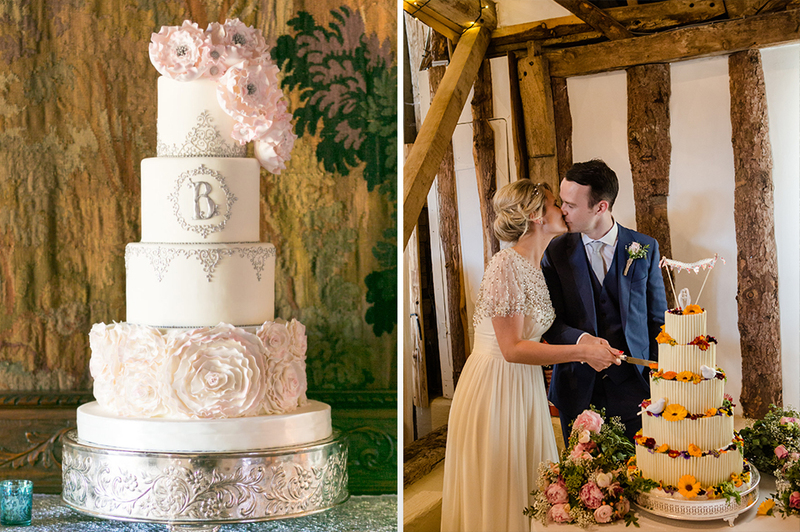 So, read on for our pick of fabulous details that are just perfect for your wedding. Bolder colours are going to be big news in 2019 so think about opting for a really vibrant, colourful look for your wedding. Alternatively, switch up the classic white palette with pops of the brightest colours you can find. 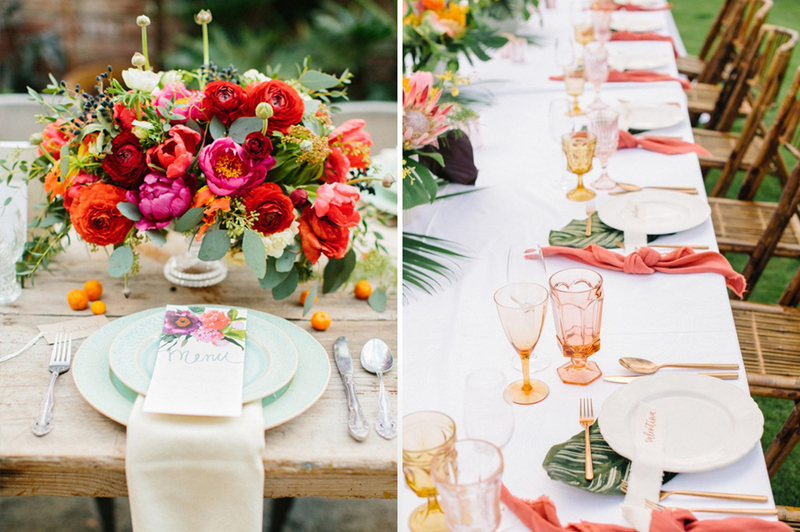 There are lots of ways to inject colour into your wedding. 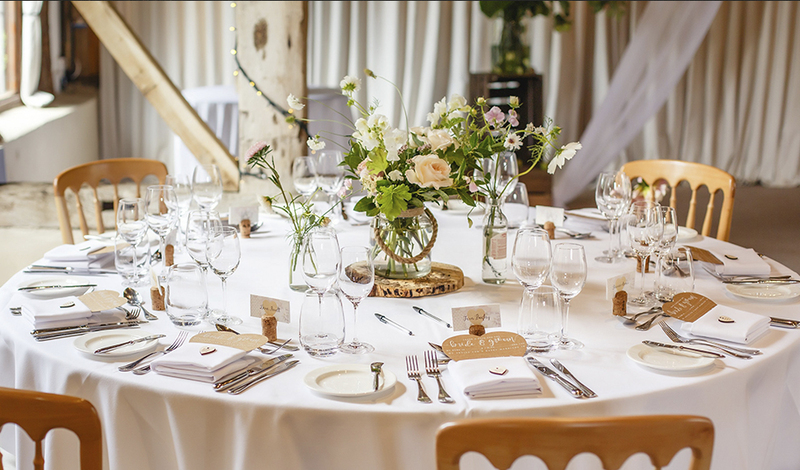 Obviously, your wedding flowers really make a difference (and more about flowers later) but don’t forget table stationery, coloured glasses and bold coloured table runners. If bold colours just aren’t your thing, soft neutrals are also going to be a great choice for 2019. Think about palettes that include soft camel, caramel, honey and taupe shades because these are warm and flattering options at any time of year. Everyone in the wedding world seems to agree that 2019 is going to be THE year for personalisation at weddings. 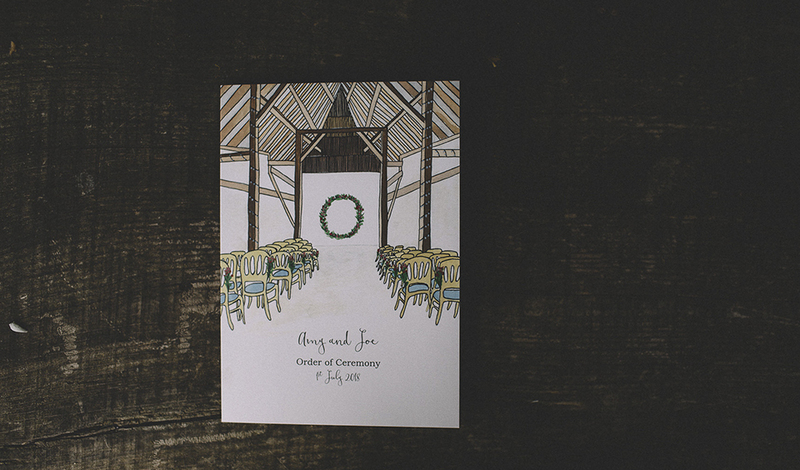 How about custom illustrated wedding stationery or hand drawn maps and menus? Ethical and environmentally friendly style is definitely going to be more important than ever this year. Couples are already starting to make eco-conscious decisions as they make their wedding plans so style your wedding with lots of vintage and reclaimed items rather than buying disposable decorations. Think carefully about your use of plastics and opt for locally produced options where you can – local honey makes a great favour for example. 2019 could well be the year that we embrace patterns too – from checked or striped table linen to patterned fabrics and fashions, patterns look great at weddings and really bring a personal touch to your style. 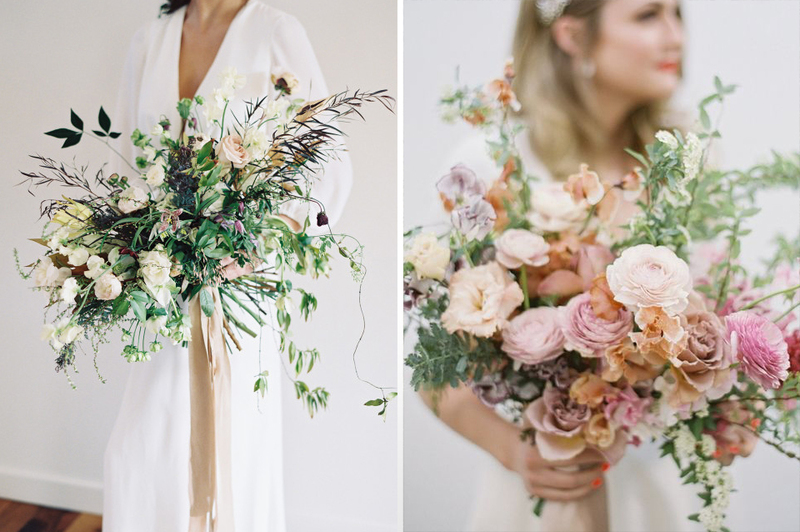 One of the biggest trends for 2019 will certainly be the move towards foam-free florals. For a long time, florists have used lots of floral foam (commonly known as Oasis) to hold blooms in place. However, following on from the move towards eco-friendly weddings, foam-free is now the way forward. Why? Well, the foam itself is non-biodegradable and breaks down into dangerous micro plastics or goes straight to landfill. So, garden-style florals that embrace a more natural and organic style will be on trend this year for all the right reasons. They don’t need foam and the really showcase the natural beauty of your wedding flowers. Of course, if your florist can work with seasonal flowers, grown here in the UK, so much the better. The other big trend for wedding flowers this year will be a return to low table centres. Towering centrepieces might well have had their day and instead, low arrangements will be taking centre stage. We love this trend – it makes it really easy for guests to chat and, most importantly, you can see everyone as you eat too! It could be the The Meghan Effect and the influence of recent Royal weddings but 2019 is going to be the year of the opulent wedding cake. Cakes with many tiers, intricate iced details and more personalisation will be everywhere this year. Add you own personal monogram to your cake along with truly show-stopping decorations to create a cake that will really impress your guests. 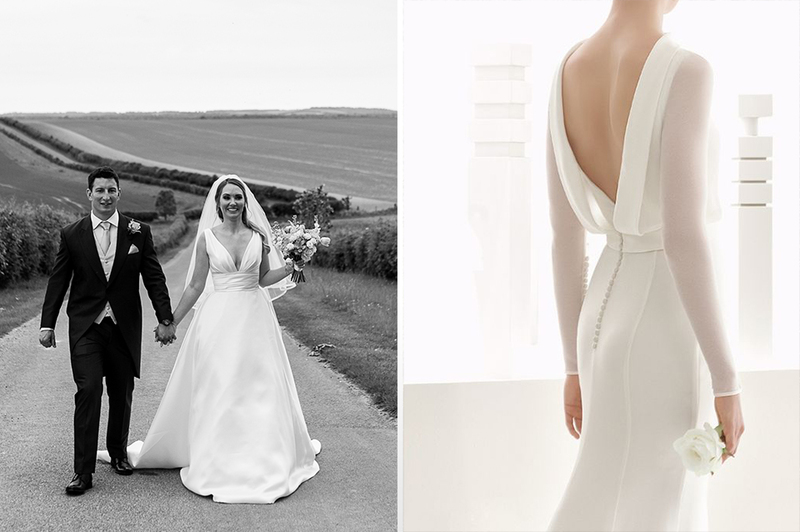 Finally, we have to talk fashion and again, The Meghan Effect is having a big influence on bridal style for 2019. There’s definitely a return to classically elegant gowns with few embellishments and a simple, stripped-back style. Gowns with sleeves will still be popular and there’s still a place for lace but the structure and fit of the dress is super important if you want to nail this minimalistic look. 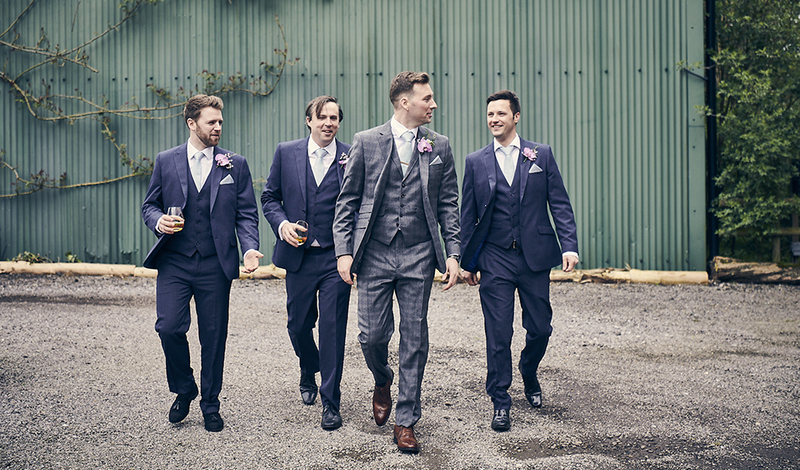 For grooms and groomsmen, a modern three-piece suit is the way to go in 2019. We don’t mean that you have to wear something completely coordinated but trousers, jackets and waistcoats are a wedding must-have this year. Mix fabrics, add some patterns and have fun with your look but remember that three is the magic number! 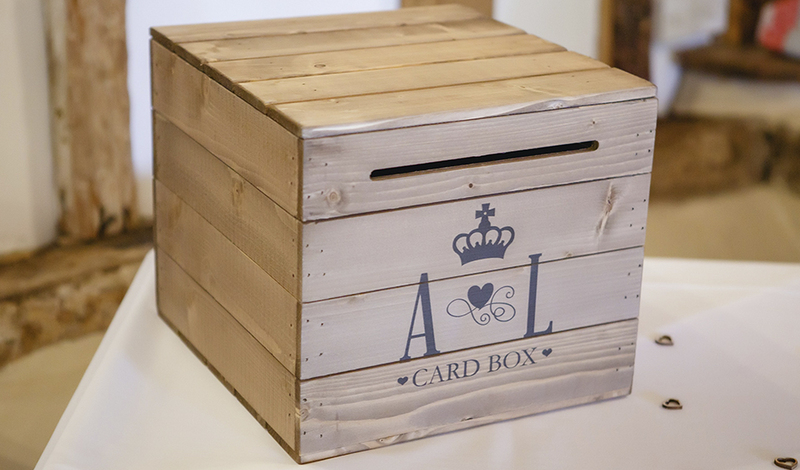 Wedding DIY is still going to be as popular as ever in 2019 so if you’re planning on getting creative for your big day, it’s time to check out these inspirational DIY wedding ideas.